Disney animated films have always masqueraded as movie musicals, especially those that were released in the 1990s. The majority of them have transferred from the screen to the [Broadway] stage, albeit with varying degrees of success (and if this pattern continues, I sincerely hope there will be a stage adaptation of Mulan or Hercules on Broadway sometime in the near future). 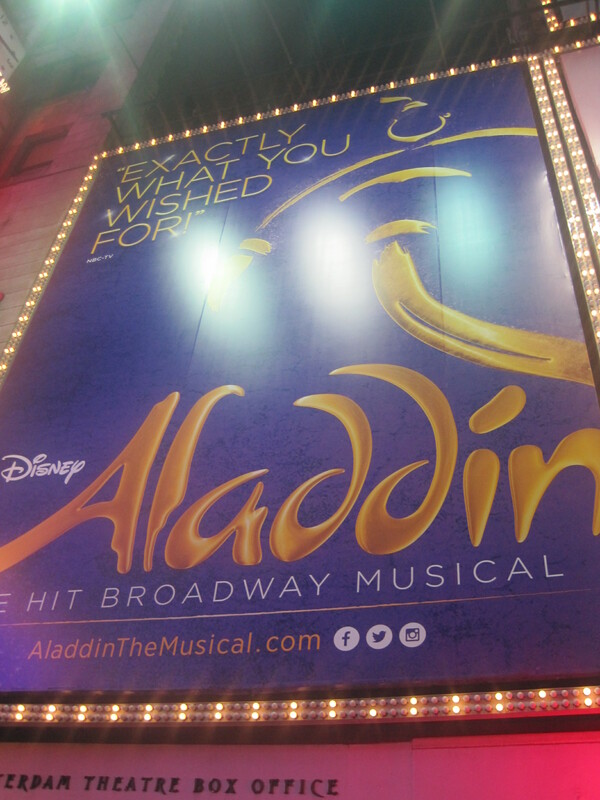 The most recent screen to stage adaptation is Aladdin, currently playing at the New Amsterdam Theatre. Per usual, I obtained tickets via the TDF ticket raffle table at the BC/EFA Flea Market & Auction, and quasi-continues a tradition of my seeing a Broadway show on Halloween night, though this year I managed to schedule a double header (i.e. two shows in one day, though technically speaking it wasn’t the “traditional” matinee and evening performance, as the first show was the already blogged about Drunk Shakespeare, whose performance started at 4pm). I’ve always been a fan of Disney animated films (who hasn’t?) and had enjoyed the screen to stage adaptations (or at least the ones I had an opportunity to see), and while I know the stage adaptation can’t be “just like” the film (for the obvious reasons), it’s always interesting to see what changes (additions, omissions and adjustments) are made, and what remains the same, and how it effects the story. While it’s been several years since I last watched the animated film, the overall look and spirit of the story remains intact: the tale of a princess and the “street rat” yearning to be more than what society expects them to be, the villain wanting ultimate power and the genie who just wants to be free. The stage adaptation has a handful of new songs, with the music by Alan Menken (who wrote the songs for the film) and lyrics by David Zippel, Stephen Schwartz and Glenn Slater, as well as new characters (Babkak, Omar and Kassim, three of Aladdin’s friends, presumably to compensate for the loss of Abu, Aladdin’s monkey sidekick in the film). There’s an additional (emotional) subplot revolving the memory of Aladdin’s mother, highlighted in “Proud of Your Boy” (one of the new songs). And of course, there’s a lot more singing and dancing in the stage adaptation, which is visually stunning, and expertly performed. I’m not quite as enamored on the new subplot/sidekicks, while it brings about a good deal of character development and (some) exposition, it seems out of place with the overall story, with some of it is reminiscent of other Disney animated films. The same can be said of most of the new songs – they don’t seem to live in the same “sound world” as the songs from the film, and faintly reminded me of other (recognizable, Alan Menken-penned songs). That being said, the standout moments came in the form of the Genie, expertly played by James Monroe Iglehart, with just about the same amount of pizzazz and sassiness as the late, great Robin Williams (who played the role of the Genie in the film). The energy he exuded was palpable and his numbers nearly (literally) stopped the show – ‘twas a Tony-worthy performance. While I was miffed that Jonathan Freedman (who originated the role of Jafar in the film) was out, his understudy, James Moye, was fantastic, with just the right amount of villainy without making it too campy, well supported by Don Darryl Rivera as Iago, (a nice change that he was played as a human rather than as a parrot, as that character was in the film). 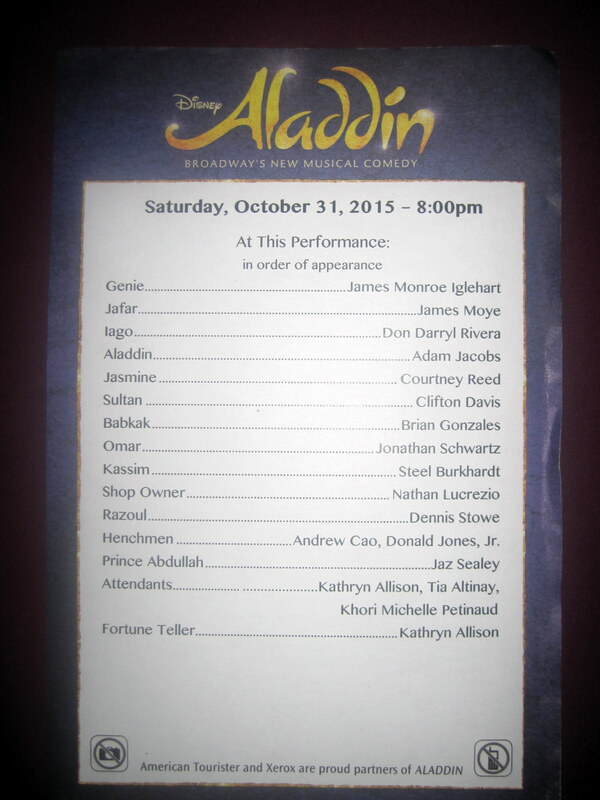 The rest of the cast, including leads Adam Jacobs (in the titular role) and Courtney Reed as Jasmine, were great. The choreography was stunning as was the overall set design, with its warm, lush colors. “A Whole New World”, complete with the flying carpet did not disappoint and was as magical as it was in the film. 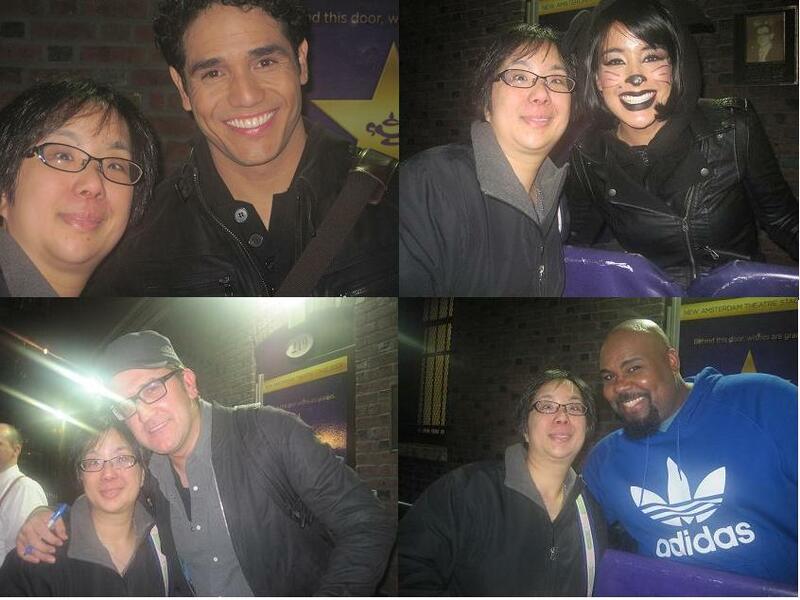 The stage door scene was not as busy per usual – I’m not sure if that was because it was Halloween night and the departing audience wanted to partake in the various Halloween festivities, yet the cast came out, chatting amicably with those who were waiting at the stage door, taking photos and signing playbills. Despite my somewhat mixed impression of the show, I had a great time, and would recommend it to those who enjoyed the film and also enjoy the previous Broadway adaptation of Disney animated films. It’s always a magical experience seeing a Disney show on Broadway. 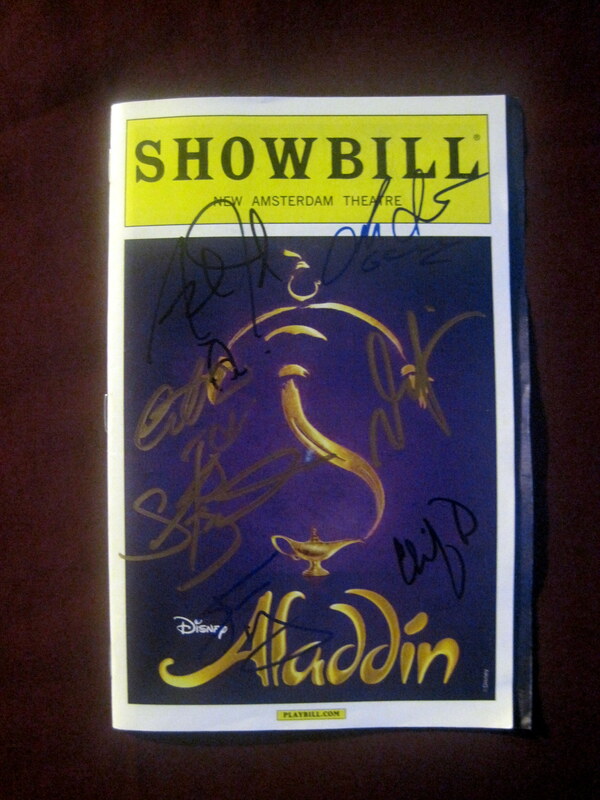 This entry was posted in Theater Observations & Musings and tagged Adam Jacobs, Aladdin, Alan Menken, Broadway, Courtney Reed, Disney, Don Darryl Rivera, genie, James Monroe Iglehart, James Moye, magic, musical, New Amsterdam Theater, theatre.